Despite a few unexpected bumps and curves in their explorations at Gusev Crater and Meridiani Planum, the Mars Exploration Rovers have been working away and both Spirit and Opportunity have put in a very productive month's worth of work on the Red Planet. Spirit has been checking out the summit of Husband Hill since arriving there late last month. "Spirit is perched as we speak right on the lip of Tennessee Valley - the very top of Tennessee Valley looking down into it from the summit," rover lead scientist Steve Squyres told The Planetary Society yesterday. In the midst of her studies of the summit and Tennessee Valley, the rover has been taking in the moons of Mars, producing an ever-growing picture collection of Phobos and Deimos. On the other side of the planet, Opportunity is back on track after a sudden, unexpected shutdown toward the end of August, and no apparent worse for the wear -- even though the MER engineers don't know what happened. "It's an unresolved issue," said Joy Crisp, MER project scientist, of the Jet Propulsion Laboratory (JPL), where the rovers were designed and built. "But," she added, "we haven't had any problems since then." In recent days, Opportunity has been tooling down the Erebus Highway and is now, at long last, closing in on Eerbus Crater. Both rovers are in good health and power positive, with Spirit boasting 885 watt hours, and Opportunity 630. While it may seem that Opportunity is a bit sluggish, "it's plenty enough for us to do a lot," said Crisp in an interview yesterday. "This rover hasn't had a good cleaning event in a while, and it's looking a little dirtier." As the winds have come and swept away layers of accumulated dust on the rovers' solar arrays, and the power levels have risen and dipped, the seasons have come and gone. And the once-daring hope that maybe the rovers could survive another year has almost turned into an assumption. The mission is now funded through September 2006. "The rovers could even go beyond that," mused Crisp. "We don't see anything [on the rovers] where we say - 'Here's the end of life.'" Even the Mössbauer spectrometer theoretically could keep going for another year, she noted. "With radioactive source life decaying, we would have to really pick our targets and spend a lot more time taking the measurements, but we should be able to get a reading." Still, as everyone in this business of space knows -- anything could happen anytime. For Squyres it's simple: "I never make promises." 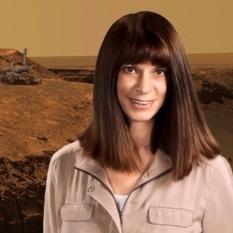 Disclaimer stated, so far, for the rovers on Mars -- it's still all good. Since arriving at summit #1 during the final days of August, Spirit has been checking out targets around the highest of the two summits at Husband Hill, and of the surroundings beyond. During the last several weeks, this robot field geologist has been taking a lot of pictures. Spirit completed the full 360-degree color panorama from the summit looking into Tennessee Valley early this month, and since then has conducted another stereo imaging campaign from a different vantage point. Spirit has also been checking out a target called Irvine, as well as moving to other areas to look at interesting soil and drift targets with her microscopic imager. In addition to all that, the rover is taking a series of images that will be pulled together to produce a self-portrait. On Sol 598/September 9, Spirit returned to Irvine. The science team decided the rover should further examine an area there dubbed Putative Dike, which may be a crack-like cut that often forms when magma from a volcano travels through or over another rock. So the rover checked it out and did some scuffs and turns and took a look at what she'd uncovered. 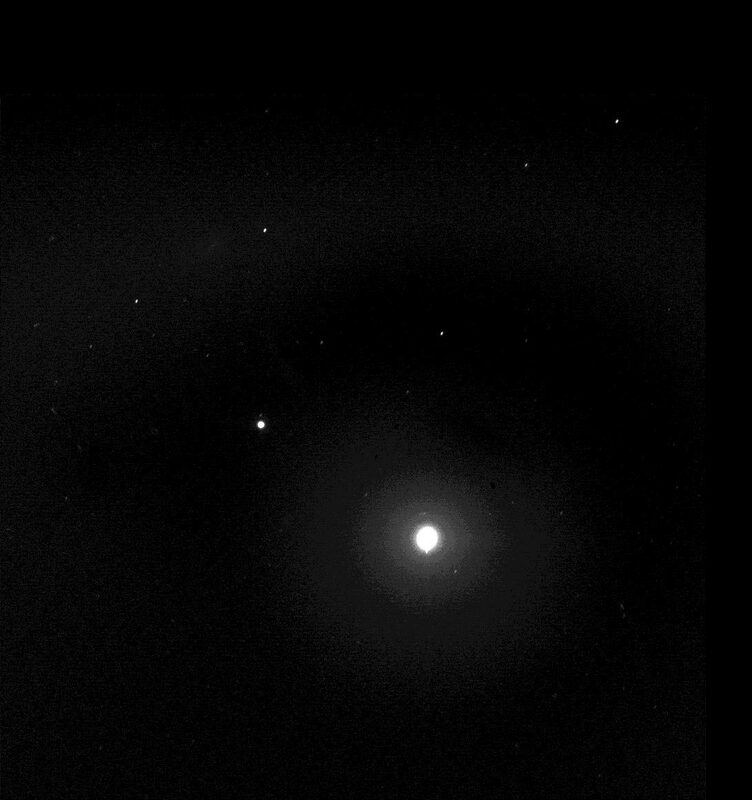 Spirit has also been "sprinkling in" some nighttime picture taking sessions of Martian moons, Crisp said, and is building quite a scrapbook of images of Phobos and Deimos. And throughout the month, the rover kept an eye on the dust accumulation among other things, and used her MI to take pictures of the capture and filter magnets (you can't see our little robot right now) and took readings with the APXS and Mössbauer on the capture magnet. Around mid-month, Spirit slowed down a bit because she was put on restricted sols. These down days occur when the timing of the communications pass from the Odyssey orbiter is too late in the Earth day to gather vital location and health information about the rover after it executed recent commands; therefore, the team back on Earth must wait until the next day to make sure the rover is where she's supposed to be. 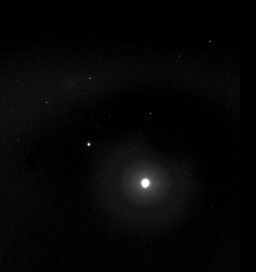 Nevertheless, by the end of Sol 605/Sept. 15, Spirit added a new accomplishment to her list of roving achievements by passing the 3-mile mark or 4,935 meters on her odometer. Beyond her science research, Spirit successfully carried out some communication and engineering tests. In its orbit around the Sun, Mars comes in close to Earth for a few months once every two years, and this month Mars has been close enough that one-way communication travel time -- from the spacecraft at the planet to the Deep Space Network antennas on Earth -- is only about 5 minutes at lightspeed. This shorter communication travel time means that the rover team has plenty of communication-link margin to support a higher uplink rate, so early in the month, the telecom team changed the rover's uplink rate from 1000 bits per second to 2000 bits per second and Spirit was able to send small deluges of data. Subsequently, Spirit performed two tests to validate the team's ability to send commands to the rover via the Mars Odyssey orbiter through the rover's ultra-high frequency (UHF) radio. Downlink through the Odyssey UHF relay has been the principal means for getting data from Spirit, but these tests were to experiment with communicating the other direction: sending commands to Spirit via Odyssey UHF relay. Indeed, it worked. The test was positive. After her second investigation at Irvine, Spirit drove across the summit to the other side of the summit plateau and up to a target the team has dubbed Cliffhanger, "a beautiful drift," Squyres described. The science team will be looking closely at the images Spirit has returned from Cliffhanger, down to the grains they can see in the MI pictures, to try and better understand how the wind moves stuff around on this alien planet. "Cliffhanger is really right at the lip of the summit plateau," Squyres said. "If you went just over Cliffhanger - 'Boom, you're down at Tennessee Valley,'" he continued. "So it was a well-chosen name. We've just finished doing a scuff of Cliffhanger with the wheels and then doing lots of IDD [instrument deployment device] measurements." All in all, it's been a good month for Spirit, a month of basking in the glory of her ascension to the top of Husband Hill. From her current perch overlooking Tennessee Valley, the rover is collecting "long baseline stereo imaging," said Squyres, "taking images from several different positions to really try and nail the geometry of the interior of the valley. We're making a really good topographic map, so we will know where all the outcrops are with good geometry." The plan now calls for Spirit to spend a little more time at the summit. "We'll hang around here for awhile longer, because there are a lot of interesting things up here," Crisp said. "We're expecting we might want to do some more robotic arm work, but it depends on what other targets we see up here." In coming days, the rover is probably going to head toward the true summit, "which is a little outcrop that is actual highest point on the entire summit plateau," Squyres said. "Not to bag the summit, but because there are some good rock outcrops over there," he elaborated. "After that, we're going to head south." Where and how exactly have yet to be determined. Down here on Earth, the MER team members will get together today for a planning meeting "to look at the slope maps and determine the interesting science things the team wants to hit," said Crisp. As always, "it's a matter of where it is okay to drive, what looks interesting, and what's a sensible path to take to hit things along the way." Opportunity's recovery from the unexpected 'power-off' event on her Sol 563/August 24, appears complete, although the MER engineers still have no idea what caused the rover to suddenly just shut down. "We proceeded very carefully, because we weren't sure what happened," explained Crisp. "We came back slowly. One day at a time we added functionality back, and each command we gave the rover executed beautifully." By sol 570/Aug. 31, the rover had successfully performed observations with the panoramic camera (PanCam), navigation camera, and miniature thermal emission spectrometer (mini-TES) and had completed a short APXS integration, with the robotic arm stowed, and a 21-foot/6.5-meter blind drive. The team took additional precautions with each sol's plan, including shutting down after the morning uplink, to save the high-gain antenna position, thus preventing an X-band fault in case of another anomaly, and waiting 15 minutes after wakeup to start any science activities. The rover responded as expected in all case. "Opportunity is okay," reported Crisp. Once she was back in the saddle, Opportunity continued her journey east to the Erebus Highway. It was slow going at first because the rover team commanded the operations with post-anomaly restrictions in place, and because the rover has also been in restricted sol mode. And along the way, the rover, as has always been the plan, has stopped to take pictures with the PanCam and navigation camera, as well as remote sending with her mini-TES. The week of September 11, Opportunity resumed normal operations, and began making significant progress toward Erebus Crater. In fact, that next sol, Monday, Sept. 12, the rovercompleted a 98-foot /30-meter drive that put her on the Erebus Highway‚ an outcrop-rich area that extends south toward the crater and provides the rover with a better surface to traverse. The rover's been heading south since then. "We are proceeding south toward Erebus Crater, and we've gotten to the point where we can see good outcrops exposed on both the western and southeastern rims of Erebus Crater," Squyres confirmed yesterday. The team has christened the patch of rocks on the southeast side of the crater, Vermillion Cliffs, and those on the southwest side they callthe Mogollon Rim. Currently, "the rover is on the highway and just about at the rim," Squyres said. But Opportunity is going to stop and check out "a really beautiful exposure of bedrock that we named South Shetland," he said. "It's not quite on the actual lip of the crater, but it's very close. Most likely, we'll spend this weekend at South Shetland." In coming days, Opportunity will continue her investigation of Erebus Crater. "The inside looks like it's filled with sand-ripple dune things," Crisp noted. Just the kind of things that make the hair on the rover engineers' arms stand on end. For now, the science team is waiting to get "closer images" to decide, Crisp added, "if we're going to go left around Erebus or right around Erebus, and that depends on what we see in terms of rock and what's drivable." Down at mission control, the Sol 563 anomaly is still under investigation. But for Opportunity up on Mars, all's well that ends well.